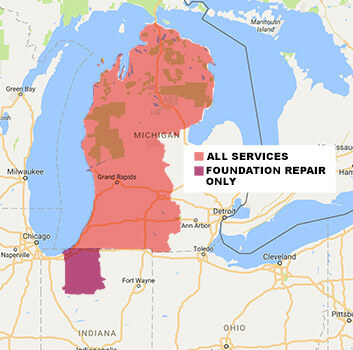 Cathrine L. of Jackson, MI was having some serious water problems in her basement before she reached out for our help. Water was coming up through the basement floor and pooling to create somewhat of an unpleasant living environment. Thankfully, we had a solution for this situation. We installed several of our patented waterproofing products for this job. We began by installing the WaterGuard French drain system. The WaterGuard drain rests below the basement floor and above the foundation footing, collecting water that seeps into the basement. Once this water is collected, it is redirected to the sump pump to be pumped up and out of the home. The sump pump, in this case, is the SuperSump premier sump pump system. The SuperSump is a sump pump specifically designed to keep your basement dry for long periods of time. Capable of pumping 2,220 gallons of water per hour, it is suitable for heavy water intrusion. Lastly, we installed the IceGuard: a grated discharge line protector for your sump pump line that is at the end of the line outside the house and can still function with a frozen underground pipe. Allows for water to leave your sump pump and be dumped outside even in freezing months.